Yesterday morning my HTC One M7 received the HTC Sense 6.0 update. for the HTC One (M7) owners this update will be very welcome. The update brings the HTC One up to Sense 6.0, sitting on Android 4.4.2 KitKat, for an experience that closely matches the HTC One (M8). Visually there are a number of changes, so you should see the difference right away, with cleaner menus offering simpler icons. You should see a OTA (Over the Air) update in the top right corner of your screen. Follow the instructions and in a few minutes you’ll be looking at the new Sense 6. 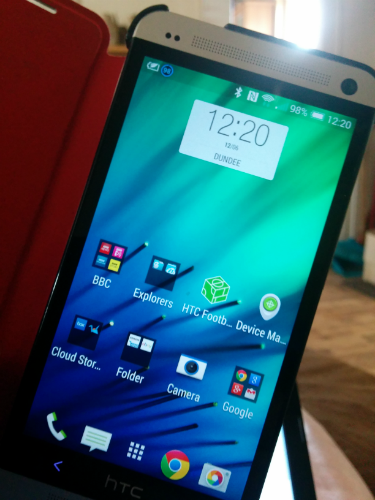 The update is 678MB, and there’s plenty of detail in the update by HTC, covering those main changes in Sense. You’ll find that BlinkFeed is now more customisable. You’ll also find the Zoe app added for the forthcoming Zoe sharing online app-come-social network that HTC is planning, but like the HTC One M8, we’re still waiting for the service to launch. You’ll find that you still have the Beats Audio option on the Beats-branded HTC One, supplanted in the new One with straight BoomSound, following HTC and Beats’ split. You also get the extreme power saver mode, something that could come in handy on the One M7. Overall, I’m very happy with this update having, used it for the last 24 hours or so.